Guest contributors John and Sandra Nowlan return from a Caribbean cruise on Holland America’s newest ship and rave about the innovative entertainment and dining options. 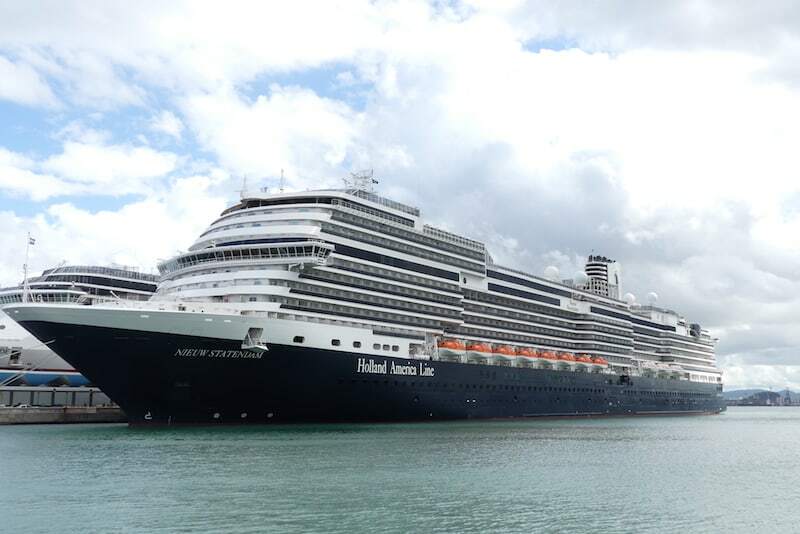 We’ve just returned from a weeklong cruise aboard the newest ship to sail the Caribbean, HAL’s Nieuw Statendam. This 2600-passenger vessel features the World Stage, the most innovative main theatre we’ve ever seen. On decks two and three, at the bow of the ship, World Stage is almost Theatre in the Round, with seats surrounding the performance area. The backdrop is a two-story, 270-degree LED high definition screen with sophisticated special effects and superb sound quality. The two 45-minute shows we saw in the theatre, “Humanity” and “Stages”, from the Step One Dance Company, feature six very talented performers and dazzling, interactive use of light, sounds and action. It was brilliant. Also brilliant on Nieuw Statendam are the ship’s four other entertainment venues. Called the “Music Walk”, the midship area has something for every musical taste. We particularly loved the Lincoln Center Stage and its group of five remarkable classical musicians – a pianist and a string quartet. In addition to traditional favourites (Bach, Schumann), the quintet performed music from the movies – Star Wars, Psycho and many others. Lincoln Center shares its stage with BB King’s Blues Club, eight talented musicians who bring the crowd alive with southern blues and classic soul. Classic rock is not forgotten. Five young rockers perform three shows daily in the Rolling Stone Rock Room, a partnership with Rolling Stone Magazine. Across the corridor, two singer/pianists alternate performance times with the rock group and honour all-time Billboard Magazine hits. It’s very interactive with lots of stories and requests from the audience. In addition to entertainment, a priority for most cruise ship passengers is the dining. Like its sister ship, Koningsdam, the Nieuw Statendam has a bright, two-story, main dining room with red and clear glass chandeliers. The innovative design reminded us of giant whale bones. It’s open only in the evening but there are plenty of other dining choices. The Lido Market on deck 9 is the main buffet venue and is cleverly divided into various food islands so crowding is minimized. Food choices are excellent, especially at breakfast. Other areas for complimentary food include the New York Deli and Pizza (very good pizza) and the Dive-In, by the pool of course, for excellent hamburgers and hot dogs. The hamburgers at Guy Fieri’s Joint on Carnival ships are still a bit better. Nieuw Statendam includes several extra-cost dining areas. We were able to sample four of them. Rudi’s Sel de Mer (named for Holland America’s Master Chef, Rudi Sodamin) is a French-Mediterranean brasserie. One recent survey claimed it had the best seafood at sea. We agree. From the massive Fruits de Mer appetizer (King crab legs, langoustine, crab claws, jumbo shrimp, mussels and clams) to marinated lobster, Dover sole, scallops, sea bass and salmon, we were impressed by the fish quality and innovative presentation. We also had an excellent meal at Pinnacle Grill, the ship’s U.S. Northwest inspired steakhouse. It’s hard to beat a great steak, perfectly cooked. Tamarind is the ship’s 140-seat restaurant that features cuisine from Southeast Asia, China and Japan. We enjoyed giant Indochine tempura shrimp and Mongolian lamb chops. Every evening, a portion of the Lido Market becomes Canaletto, an excellent Italian restaurant that’s now part of almost all Holland America ships. Because of its Dutch heritage, large elegant floral arrangements are scattered throughout the ship. Another delight is the creative artwork on every staircase and in most public areas. We love quirky and the 3D artwork and unusual sculptures delivered many smiles. On Deck Nine, there’s even a six-foot glass reproduction, anatomically correct, of Michelangelo’s “David”. For fun, he’s holding a smartphone for a selfie. After a welcome day at sea, we arrived at the Commonwealth of Puerto Rico, a Territory of the United States. It was a delight seeing the 16th Century landmark fortifications and the Spanish Colonial buildings in the Old Town, now a UNESCO Heritage Site. We joined a Spoon Food Tour led by Pablo, an entertaining guide, who knew the history of every nook and cranny and who introduced us to some unique Puerto Rican cuisine – Mofongo (the national dish of fried plantain with chicken and sauce) and Pernil (marinated roast pork with beans, rice, ceviche and churros). That fascinating city was followed by another sea day and two beach days, first at Trunk Bay Beach on the island of St. John, a half-hour boat ride from our landing in St. Thomas. The beach was wonderful (great snorkeling) but we passed evidence of much destruction from recent hurricanes. The last beach day and our last onboard (we love Caribbean beaches, especially during our winter) was on Holland America’s private Bahamas Island, Half Moon Cay. Reached by large, efficient tenders, the white sand beach is superb with the clearest ocean water we’ve ever seen. Some guests chose optional horseback riding, kayaking or Sea-Dooing. There were plenty of beach chairs available. Back on board, the ship offered its guests cold towels and drinks. Even some ultra-luxury lines don’t do that anymore. *All photos by John and Sandra Nowlan. The Nowlans are travel and food writers based in Halifax. Disclosure: The Nowlands were guests of Holland America Line. Wow! Too bad I don’t like cruises (and they don’t like me)… otherwise, I’d go. Sounds fantastic!